YummyInTheCity: The Breslin - Wear your best flannel and puffy vest! The Breslin - Wear your best flannel and puffy vest! So I went to The Breslin yesterday morning for brunch to check out what everyone's been talking about. Boy was I glad I had whipped out the grandpa cardigan and oxfords! The place was crawling with facial hair, flannel, puffy vests - moneyed people outfitted by the adjacent Opening Ceremony, spending who knows how much to look like they stepped out of Goodwill! If you ask me it was all a little too much for me.... anyhow onto the food and decor. A bit too dark for my taste - definitely too dark for brunch, but I suppose the lack of light matched the rustic dark wood decor giving an air of heaviness to the environment. A heaviness that was certainly matched by the food. I had the pumpkin pancakes which were quite lovely. Not particularly light or eggy - more like a multi-grain pancake. My boyfriend said it reminded him a bit of eating oatmeal, it definitely had that kind of heartiness to it. I obviously ordered a side of the house cured bacon. Now this was delicious. But definitely a heart attack in the making. Fatty, fatty, fatty...You definitely need some sort of acid to counteract all that grease and fat. Perhaps a Bloody Mary? Our neighbors had the full English breakfast - fried egg, sausage, bacon, tomatoes and mushrooms. $21 bucks! Urmmmm......I don't know about that. 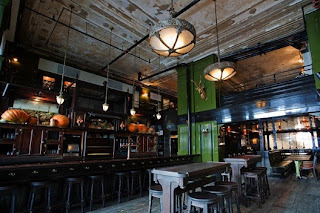 All in all, I probably wouldn't come back to The Breslin - I am not a huge fan of the heavy Irish pub fare, but those true Spotted Pig lovers will definitely appreciate it. I would however come back to the lounge at The Ace Hotel - if only to people watch!